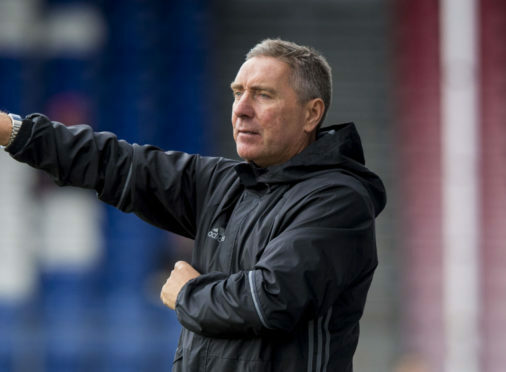 Jim McInally's side were beaten 3-0 by the Pars at East End Park. Two late goals helped Dunfermline to a 3-0 victory against Peterhead at East End Park last night. Myles Hippolyte opened the scoring three minutes before the break with a late Kallum Higginbotham penalty and an injury time strike from Andy Ryan helping the Pars take all three points. The result leaves the Blue Toon with two points after two games in Group D of the Betfred Cup. The Blue Toon were beaten 5-1 by the Pars at the same stage of the competition last season but made a promising start with Pars goalkeeper Lee Robinson called upon to make a superb save to prevent Lee Ashcroft diverting a Jack Leitch cross into his own net. The Pars seized the initiative as the half wore on with Hippolyte going close with a well-struck free kick from the edge of the area. The Blue Toon were almost caught out with a swift counter-attack after 31 minutes but Louis Longridge was denied by Greg Fleming. But the Peterhead goalkeeper was helpless to prevent the Pars opening the scoring three minutes before the break when Ryan Williamson crossed for the unmarked Hippolyte to nod home. The Blue Toon were inches away from restoring parity after 53 minutes. Peterhead captain Rory McAllister drilled a free kick off the post from 25 yards with Russell McLean denied by the woodwork on the follow-up. The Pars put the result beyond doubt three minutes from time when substitute Aidan Connolly was brought down by Willie Gibson inside the area and Higginbotham coolly converted from the spot before a fine solo effort from substitute Ryan completed the scoring in the dying embers.